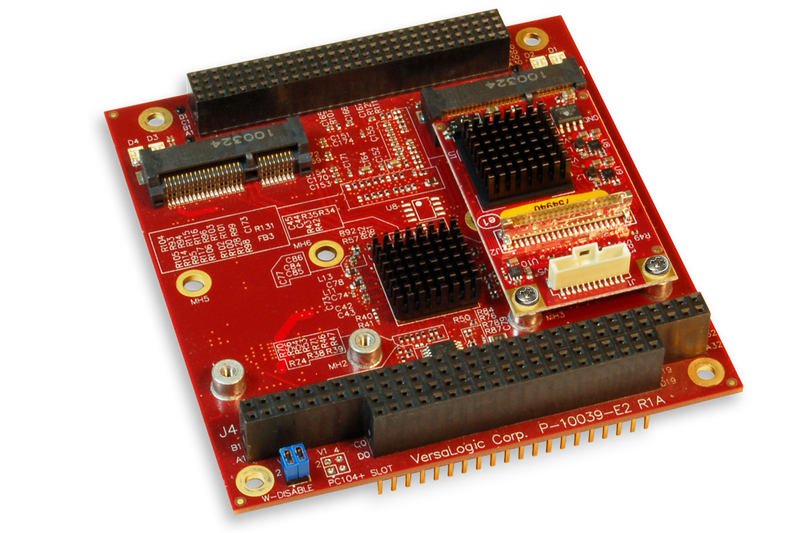 The V7 can be used as a development tool for VersaLogic's headless (no video output) single board computers, or to provide an additional video output for any PC/104-Plus or PCI-104 embedded system. VersaLogic Corp., an Oregon-based embedded computer company, today announced the VL-EPM-V7 video expansion module. 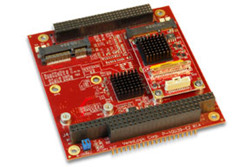 The “V7” is offered in two different module versions for use in PC/104-Plus™ or PCI-104 embedded systems. The V7 modules provide a simple, economical, and standardized way to add LVDS and VGA video outputs to embedded computer boards. The PC/104-Plus version of the V7 supports PCI and ISA stackable expansion buses. The PCI-104 version supports only the PCI expansion bus. Both modules are based on the industry standard PC/104 form-factor: 90 mm x 96 mm (3.55” x 3.78”). "The V7 can be used as a development tool for VersaLogic's headless (no video output) single board computers, or to provide an additional video output for any PC/104-Plus or PCI-104 embedded system," said Len Crane, President of VersaLogic. The V7 utilizes a Silicon Motion SM750 embedded graphics processor with 16 MB integrated RAM. The graphics processor delivers 2D graphics capabilities with simultaneous and/or independent analog VGA and LVDS video outputs. The analog VGA video interface supports up to 1920 x 1080 (16-bit color) and the LVDS interface supports up to 1280 x 1024 (18/24-bit color). The graphics processor's advanced power reduction (throttling) and power-down (sleep) controls, keep the power draw low in most embedded applications. The V7 supports simultaneous analog VGA and LVDS video output. The V7 includes a PCI Express Mini Card socket that accommodates plug-in data acquisition, MIL-STD-1553 interfaces, non-volatile flash data storage, and other plug-in expansion cards. On-board LEDs provide status for the socket. The V7 is compatible with a variety of popular x86 operating systems including Windows, Windows Embedded, Linux, VxWorks, and QNX using standard software drivers. The on-board video BIOS also supports VESA standard graphics modes. The V7 is designed and tested for industrial temperature (-40° to +85°C) operation and meets MIL-STD-202G specifications to withstand high shock and vibration. Latching connectors provide additional protection within harsh environments. The V7 is covered by VersaLogic's 5-year product warranty and exclusive 5+ year production life guarantee. Customization services are available even in low OEM quantities. Customization options include conformal coating, revision locks, custom labeling, custom testing and screening, and more. Both V7 models are available from stock. Pricing is $402 to $437 in OEM quantities, depending on the model. Contact Sales(at)VersaLogic(dot)com, or visit http://www.VersaLogic.com/V7 or http://www.Digikey.com for more information. VersaLogic Corp. built its reputation on very high reliability products and superior service. A 35-year history of consistency has earned VersaLogic the reputation of being the industry's most trusted embedded computer company. VersaLogic delivers state-of-the-art embedded computers, coupled with expert technical support, for critical markets such as the medical and defense industries. For more information, visit http://www.VersaLogic.com.